Pictorial key to the Tarot, by A.E.Waite. There is stellar information encoded in the symbols of the Rider-Waite Tarot deck and none sums up the human condition better than the seventh card of the major Arcana, The Chariot. 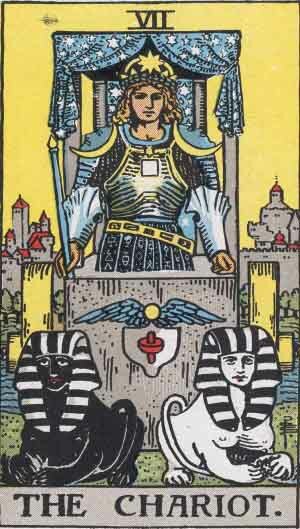 The charioteer is the human being, the two sphinx’s that pull the chariot symbolise our two minds, one reptilian the other divine, forever pulling us in opposite directions.The symbology on the card is all about the dual nature of man and his inner struggle to control his thoughts and take possession of his consciousness. Take note: the driver has no reins because the mind does what it wants…and needs to be reined in. The twin towers in the background symbolise duality…the twin pillars of Solomon’s temple. The driver of the chariot has crescent moons on each shoulder. The moon is the ruler of our emotions, our innermost thoughts, fears, feelings, disappointments and desires. It is a symbol of the ego in its endless battle of ‘us and them’. The stars in the canopy reveal how are lives are governed by the vibrations of the planetary lords[astrology] that wield power over the destiny of human kind, both positive and negative in line with duality. The four pillars represent the number four. Four is the value of the Hebrew letter Dalet and means doorway….a doorway into higher realms of being for those who can overcome the desires of the reptile mind. “The half-wise, recognising the comparative unreality of the Universe, imagine they may defy its Laws–such are vain and presumptuous fools, and they are broken against the rocks and torn asunder by the elements by reason of their folly. The truly wise knowing the nature of the Universe, use Law against laws;the higher against the lower; and by the Art of Alchemy transmute that which is undesirable into that which is worthy. mastery consists not in abnormal dreams, visions and fantastic imaginings or living, but using the higher forces against the lower–escaping the pains of the lower planes by vibrating on the higher. Transmutation, not presumptuous denial, is the weapon of the Master. Numerically the Chariot and the Tower are united for they are both seven. 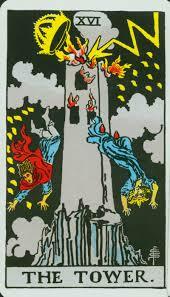 Esoterically speaking, faulty thinking through lack of control[the Chariot] leads to punishment and loss: The Tower.